We are not all born with perfectly straight teeth. Sometimes the position of the teeth is not aesthetically pleasing and sometimes the position of the teeth is damaging to the other teeth, to the gums and to the underlying bone. myAlign services allow us to move teeth utilizing clear aligners from Invisalign. This is a conservative way to move teeth into their ideal position. 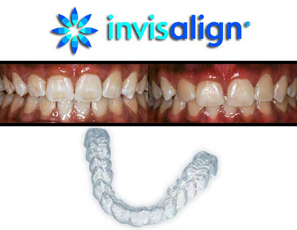 Invisalign aligners are removable clear medical grade plastic appliances that are nearly invisible. This enables many adult patients to accomplish orthodontic treatment without braces. The course of treatment is usually 12-30 months and involves a series of precision aligners that are worn for 2 weeks at a time. The advantage of this type of treatment is that no metal wires are worn on the teeth and you are able to enjoy the foods you love and accomplish the treatment with minimal aesthetic compromise. Our office also works with some of Toronto’s top Orthodontists to provide a comprehensive array of traditional orthodontic treatment to our patients if and when needed. To find out how to get the smile you always wanted call us or Click Here to set-up a consultation with Dr. Hagi.